Supermodels will be strutting down the runway to expose Victoria's Secret on tonight's broadcast of "The Victoria's Secret Fashion Show" on CBS. The Early Show's weatherman Dave Price went behind the scenes to get a preview of the event. Though the show was full of eye-popping fashions, the highlight came when Heidi Klum appeared in a multimillion-dollar outfit. The bra Klum says, "gives you $11 million support." Made in gold, she points out, it will not rust. But that is not the only thing special about the bra. Klum says, "It has a 70-carat diamond. It's the second biggest diamond in the world dangling on the stomach. And then the breasts are covered in diamonds and stones." Top model Tyra Banks explained to him there are fashion trends even in the world lingerie. She says, "Lingerie styles do change, the decolletage, that's the French word for cleavage, that different shape changes per season." On The Early Show, Banks tells co-anchor Harry Smith, "I do this fashion show only once a year. I don't do fashion shows anymore," says Banks. "I'm not a fashion model strutting the runways for designers in New York or Paris, so to me this is a very special night." Banks hits the runway with Klum, Gisele Bundchen and other glamorous peers on the show known for its unique fashion presentations. Asked if she is self-conscious about the amount of clothes she will be wearing, she says, "The great thing about Victoria's Secret is every single model up there is wearing what she's comfortable with and the people that style the show know what Tyra likes to wear and what Tyra doesn't like to show." The fashion show will also feature globally acclaimed singer and musician Sting and R&B sensation Mary J. Blige performing their new duet, "Whenever I Say Your Name." 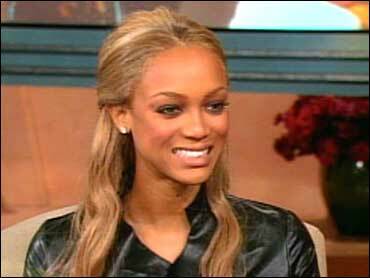 Banks recently was executive producer and star of the hit UPN reality series, "America's Next Top Model." Proudly she says, "We got picked up for a second season. Our ratings are skyrocket ratings on UPN so we'll be back in January." And that is not all. She says, "I'm going to be making movies and producing them and writing them and scripted television producing. I like being in charge." In 1992, Banks had a small part in the British production of "Inferno"
In 1994, the model/actress played a recurring role on "Fresh Prince of Bel Air." She was also a featured model on the Sports Illustrated calendar. In 1995, Banks had a role in John Singleton's "Higher Learning"
In 2000, Banks was featured in "Love and Basketball"
In 2002, the actress co-starred in the summer horror feature, "Halloween: Resurrection"
In 2003, Banks hosted the reality television series "Supermodels." She is also working on Disney's "Honey Thunder Dunk."